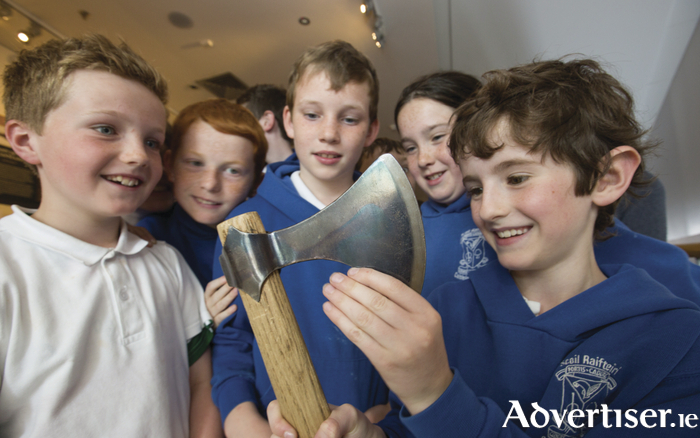 Pupils from Scoil Raifteirí, Castlebar, at the National Museum of Ireland of Country Life, see the new exhibition 'The Hoard and the Sword: Echoes of the Vikings in Mayo'. Photo: Keith Heneghan / Phocus. Mayo Sports Partnership in conjunction with Breaffy GAA is organising a Breaffy walking group for beginners and advanced walkers of all ages, for men and women. Go along to information/registration evening on Wednesday July 6 at 8pm in Breaffy GAA clubhouse. The annual around the lake, Furnace 10k walk in aid of the Mayo Roscommon Hospice will take place on Sunday July 10 - starting from Derradda Community Centre (just off the Newport to Mulranny road ) between 12 noon and 2pm. Go along and make a donation on the day or request a sponsorship card from Margaret at (086 ) 8335394 or Helen at (087 ) 2263540. Join in on this beautiful walk and support this worthy cause. Refreshments are served at the finish line. The Erris branch of the Irish Wheelchair Association held its annual barbecue in the Gateway Leisureplex on June 24. Music was provided on the night by The Duets. A great night was had by all who attended. The organisers would like to extend a sincere thank you to the management and staff of The Gateway Leisure; they would also like to thank all who sponsored food for the event, namely O'Haras Bakery, Carrs Foods, Tom Dempsey, Sheridan’s Butchers, Surdival Foods, Reilly’s Butcher, Bangor Erris, John Conroy Fruit and Veg, and Cuffe’s Centra. Thanks also to those who donated spot prizes. They would also like to extend their thanks and appreciation to the people of Erris for their continued support. Progress Art Network will host a two day life drawing workshop with Japanese artist Sahoko Blake in the Quay Community Centre Westport on Saturday and Sunday July 2 and Sunday, July 3 from 11am to 4pm each day. The cost is €120. For more information call Cathal McCarthy on (087 ) 6699142 or email [email protected] to book. Beginners are welcome and lunch and materials are provided. A fundraising event in support of Westport man Brian Langan who suffers from MS will be held in Hotel Westport and will see the return for one night only of Rooftops to the venue will take place this evening, Friday July 1. The night will see entertainment provided by The Clandestions, a seven piece ska, roots and reggae band, with DJ after. Tickets cost €15 and are available from T Burkes, Tobys, McGings, The Helm, and The Towers, doors open at 9.30pm, with music getting under way at 10pm. A public mini-vigil will be held at Knock Shrine on Friday July 1 with confessions from 8pm to 9pm and Vigil from 9pm until midnight in Knock Parish Church. As part of the Seosamh Mac Gabhann Summer School (July 3 to 8 ) a heritage tour will take place on Sunday July 3. The tour which is open to the public and free to attend will commence at the ‘Cois Tine’ Heritage Centre in Kilmovee at 2pm. The Mayo Peace Park Committee are hosting a special National Day of Commemoration ceremony for the Mayo area, at 12 noon on Sunday July 10 in the Mayo Peace Park in Castlebar. The main focus on this event is to remember the 100th anniversary of the Battle of the Somme, as so many Irish soldiers died in the carnage of that terrible battle. Huge numbers of those were from the west of Ireland. Mayo Peace Park would like to invite relatives and family members to join them on the day. For more information [email protected]. Mayo Gaels' Bórd na nÓg has set up an initiative to raise money for two amazing children's charities, The Ronald McDonald House and The Jack & Jill Foundation. It is holding a 24-hour event from 7pm on August 12 to 7pm on August 13, and it involves 20,000 laps of the walking track in Abbey Park, Mayo Abbey. Sponsorship cards are available by contacting James Fallon on (087 ) 908 1818. The Castlebar indoor food and craft markets are in the Tennis Pavilion on today from 9am until 2pm. Support local food and craft producers.